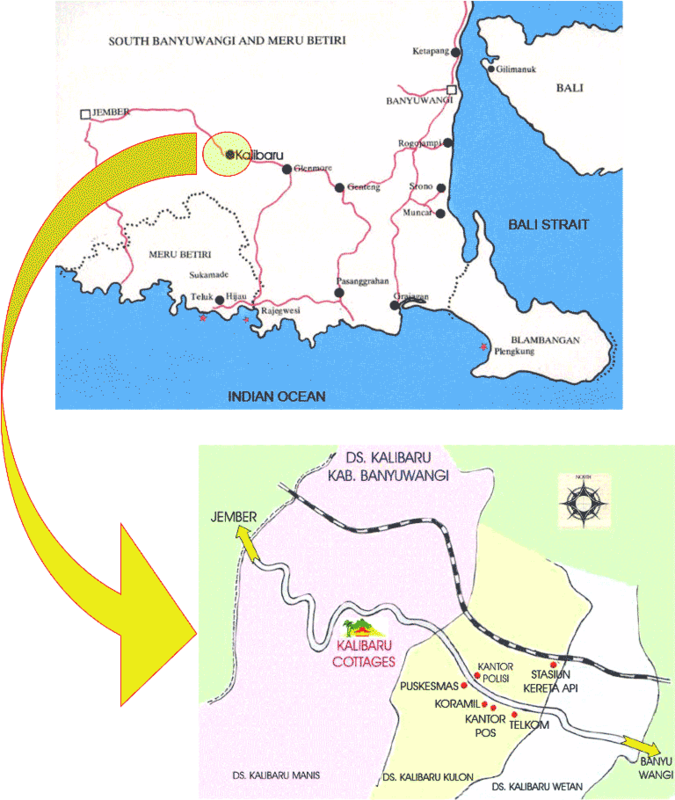 Kalibaru Cottages is situated between Jember and Banyuwangi, about 43 km from Jember or 60 km from Banyuwangi in the eastern side of East Java, located at 430 meters above sea level. The special Kalibaru charm is apparent in the short journey to the resort. The bustling street change into charming country road and peaceful villages. While entering Kalibaru Cottages you’ll be delighted to find a large open parking place. Kalibaru Cottages has 60 guest rooms. Each equipped with hot & cold water shower, telephone, television and mini-bar, offering Pool & Garden View rooms. At Kalibaru Cottages there is an endless variety of ways to relax. As you check-in it is impossible not to be taken in by the Javanese motives such as bamboo webbing, towering pyramid ceiling and artifacts that adorn the lobby before you are graciously ushered to your room. The relaxed lobby lounge, Gandrung, serves light snack and tropical coolers throughout the day and evening, where there is live Banyuwangi traditional performance nightly starting at 8 pm. Surrounded by coffee & cocoa traditional plantation, Kalibaru Cottages offers an accomodation which is carefully designed to fulfill guest privacy, as well as enjoy stunning natural beauty of landscape gardens. Kalibaru Cottages provides a huge swimming pool, children playground, meeting room, large garden, badminton court and futsal field, to made sure guest have enough exercise during their stay. There are two choice of dining. Mountain View Restaurant available with its unique Indonesian, Continental and European menu served for perfection. While drinking freshly brewed coffee, Garden Terrace Coffee Shop provides spectacular panoramic views from its perch.